How do we reduce the buyer’s perceived risk? Competition is brutal. It’s tough to close a new account. Even so, there’s some opportunities that you see as a slam dunk, but when you lose that deal, it may just be that the prospect saw you as too risky. Why? Why does the prospect see you as too risky? First, most people have an aversion to risk. Renowned expert, Daniel Kahneman studied risk aversion for over 50 years. He found that we prefer the sure thing to the gamble, even when the payoff of the gamble is much higher. Kahneman experimented with many variations in the sure thing. And what he found was most people on average would accept as little as one-half of the payoff of the coin toss to get the sure thing., proving the old maxim, that A bird in the hand is worth 2 in the bush, and that most people have an aversion to risk. A major reason that most people have an aversion to risk is skepticism. At some point in their lives made a bad purchase decision. They got “took”; they felt like a chump, and they became skeptical. And they bring that skepticism into your sales call. Asking powerful questions is a great way to help your prospect identify and share what they perceive as risky. Then you know what to include in your presentation such as guarantees, testimonials, statistics, process, or case histories. How they manage risk in a buying decision often reveals whether you need to escalate to the C-Suite to get a decision. The best way to win the Less Risky Sale is by anticipating subtle risk factors through a mindset shift called the pre-mortem. We take as given that we lost the sale and answer the question “why?”. Philip Tetlock identified the pre-mortem as part of the art and science of prediction. An open mind is key to making better predictions! So, anticipating why we lost the sale helps identify solutions to lower the prospect’s perceived risk. 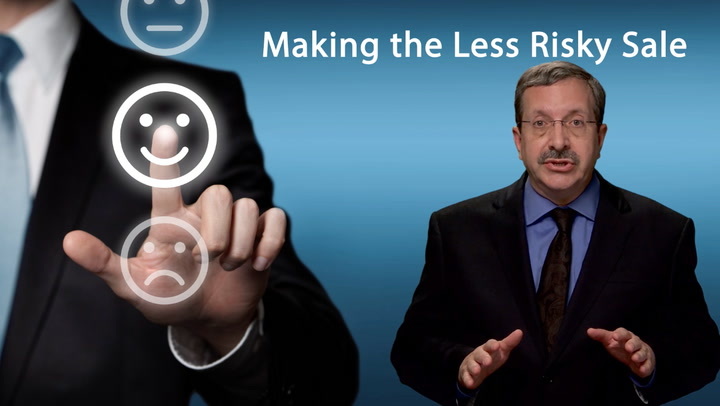 Making the Less Risky Sale means recognizing the prospect’s aversion to risk and skepticism, helping them define the risk, and presenting solutions to lower the risk to buy from you.